China’s air is notoriously toxic: Each year, it contributes to the premature deaths of some 1.6 million people. Concerned about how such pollution was affecting his family, Beijing-based data scientist Yann Boquillod founded AirVisual Earth, an online air pollution map that uses data from satellites and more than 8000 monitoring stations to display global air pollution in real time. 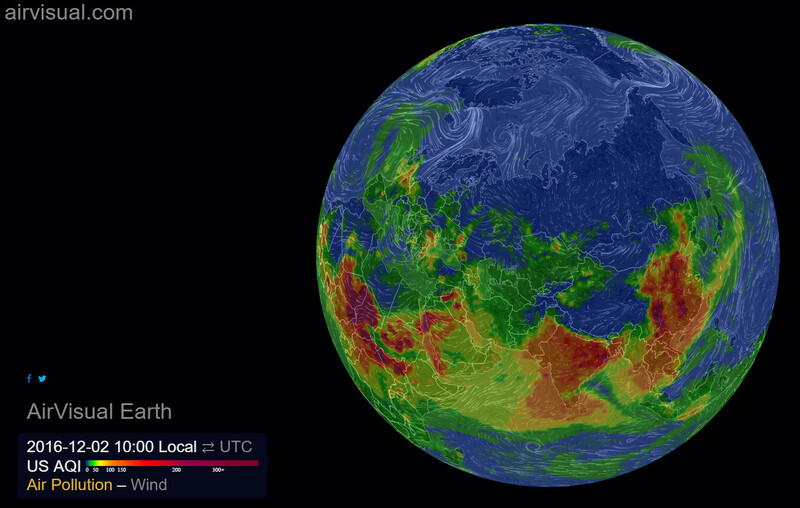 The AirVisual Earth interactive maps prevailing wind patterns and shows color-coded concentrations of PM2.5-airborne particulate matter less than 2.5 microns in diameter that can penetrate deep into the lungs. Users can zoom in, tilt, and spin the globe for better viewing. The air pollution visualization was crafted “so people really understand how bad it is,” says Boquillod, who hopes an informed citizenry will pressure governments and communities to clear the air. AirVisual also delivers 3-day air pollution forecasts for 6000 cities to smartphones, and it recently began selling low-cost monitors people can use to track indoor and outdoor air pollution. “People want to share that data,” Boquillod says.